← Lichen on the wall? 24 hours after my initial sighting this beautiful insect, known as a Spiny-leaf Insect or Macleay’s Spectre, hadn’t moved very far and was looking very vulnerable hanging on under the eaves. After some research regarding suitable species I gathered a few leafy twigs, put them in a jar of water on the table and transferred the Spiny-leaf Insect onto them. Next morning, after some initial concern at her disappearance, she was located on our ceiling and gently moved back to the vegetation in the jar. There was no sign that she had eaten anything from the selection provided so obviously these young shoots were not her preference. 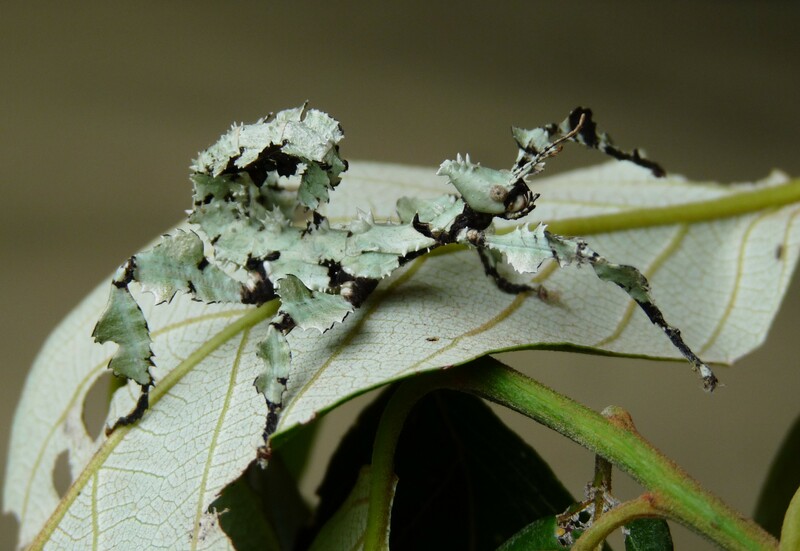 A local Phasmid lover and friend, Daintree Boatman, was called for advice regarding suitable food plants. Murray dropped in for an inspection, so did our friendly next door potter and nature lover, Ellen with exclamations of delight over such a wonderful creature. So, Allen made an extensive search by torchlight for exotic Guava but without success. It would appear that we have very effectively managed to eliminate this weed from the property! Alphitonia petrei was the next on the list and finally we have had success. There was great excitement at finding droppings on the tablecloth this morning – like all Spiny-leaf insects, she prefers to eat in the dark. So now I can confidently put her on the correct species and hope that a hungry predator doesn’t spot her. Its a wild world out there so perhaps just one more night in the relative safety of our house? This entry was posted in Insect Life. Bookmark the permalink.